Mera Peak Trek and Climbing. we Provide Best Reasonable Cost All Trip. 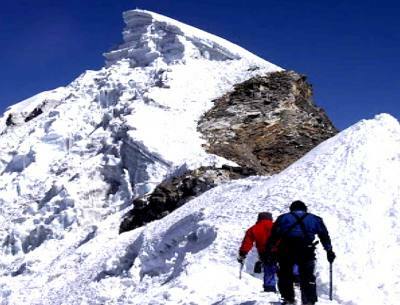 Mera Peak Trek & Climbing, a wonderful experience of a lifetime adventure achieving your goal and dream on top Mera Peak at 6,461 m high, which is one of the highest trekking peaks of Nepal. mera Peak Trek & Climb, truly a pure adventure which leads you away from mainstream trekking trail of Everest Base Camp, walking into pure wilderness into remote eastern Khumbu of Everest region. 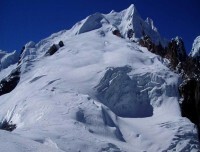 Mera Peak a popular trekking peak due to its accessibility and less challenging mountain to climb, however, all climbers should be physically and medically fit for the trek and climb of Mera Peak, and we have allowed enough days for acclimatization and practice for this super climb so that all our travelers can reach the summit safe and sound with the help and support of our highly expert guides and staff. all of the trekking peaks of Nepal Himalaya, as Mera Peak is least challenging with less technical difficulties, the climbing grade of PD which means ‘per difficult’ lest difficult however walks and climb leads over moraine-ice and glaciers. 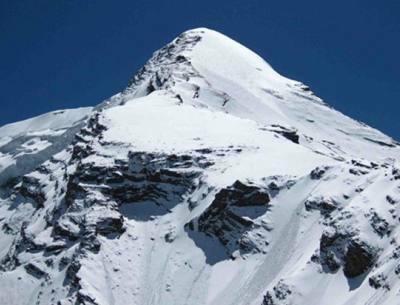 Mera peak Trek & climbing is one of the popular climbing in Nepal. 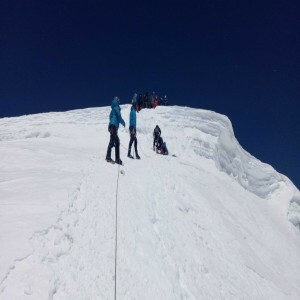 Mera Peak Climbing is a wonderful experience of a lifetime adventure achieving your goal and dream on top Mera Peak at 6,461 m high, which is one of the highest trekking peaks of Nepal. 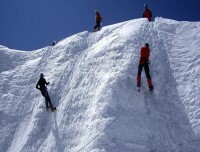 The grading taken from French and Swiss Alpine Climbing Classifications used worldwide on this alpine climb. mera Peak Trek & Climb starts with a scenic and short flight to Lukla and then walking towards remote eastern Khumbu areas over scenic passes of Naulekh Himal to reach at pristine Inkhu valley, with enough rest for acclimatization walk continues at the base of Mera Peak at Khare. climb leads following our expert guides where all necessary safety support will be added for the safe climb and descend, enjoy the superb views from the top of Mera Peak and walk back to Lukla after achieving your lifetime dreams and goal, and in high spirit with marvelous adventure on Mera Peak Trek & Climb. Adventure of a lifetime experience above 6,461 m high Mera Peak. Breathtaking views from the top of Mera Peak with Everest and other high mountains. Daily walk within traditional and cultural Sherpa villages. Highest altitude 6,461 m on top Mera Peak summit. 1Arrive in Kathmandu via respective airlines and transfer to hotel.On arrival at Kathmandu international airport you will be well received by Reasonable Treks & Tour staff and guide and then transfer you to your hotels within the hub of Kathmandu city around the most happening and exciting place around Thamel. Evening after checking into your rooms with refreshment our guides will brief regarding Mera Peak Trek & Climb includes welcome dinner in a nice authentic Nepalese restaurant with culture show. 3 Fly to Lukla 2,830 m & trek to Chutanga 3,430 m - 04 hrs.Catch the early morning scenic flight to Lukla to begin this fabulous adventure to Mera Peak Trek & Climb, from Lukla town with its unique airstrip walk leads downhill following the trail towards east past Lukla town and small Sherpa villages, in the quiet areas to camp within woodland at Chutanga for overnight stop and camping. 4 Trek to Thuli-Kharka 4,300 m - 06 hrs.After Chutanga, adventure continues with morning climb crossing over Kalo Himal Ridge of Nau-Lekh mountain range, separating Khumbu and Hinku Valley and towards west of Makalu region. 5 Trek to Mousum-Kharka 3,430m - 04 hrs.From Tuli-Kharka, a short morning walk with downhill and excellent view of Peak 43 and Kusum Kanguru peaks, reaching a scenic Hinku valley, with South Face views of Mera Peak and back into rhododendron and pine forest, with gradual walk through forest to reach a summer pasture at Mosum-Kharka for overnight stop. 6 Trek to Kote 4,182 m - 04 hrs.After Mousum-Kharka, today a short morning walk following north on leaving forested area with a pleasant walk to reach a wide open valley with pasture land, as the trek continues to a small bridge to reach Gondishung near Kote, this place with small wooden huts and shelters of stone wall enclosures, Gondishung with an interesting 200 year old small Gompa (monastery / shrine), from here a short walk brings you to our overnight stop at Kote with afternoon free to relax and short hike around this beautiful pastureland. 7Trek to Tagnag 4,360m - 05 hrs.With a pleasant stop at Kote another short day walk which helps you with acclimatization and can enjoy the surrounding beautiful views on the leisure walk towards our overnight stop at Tangnag with few tea-houses serving as simple lodge for travelers, this is also a temporary settlement and a Yak grazing pastures. 8 Rest day at Tagnag for acclimatization.At this altitude at above 4,360 meters high, necessary rest day for acclimatization, before heading higher altitude and for the climb of Mera Peak, today a short hike to get the best views of Peak 43 at 6,769 m with Mera Peak. 9 Trek to Khare 5,000m- 05 hrs.From Tagnag with nice rest day, starting with moderate walk with scenery that surrounds this Hinku valley, walk follows on moderate path over moraine dam of Charpatti Tal (lake), leading to a high area, lined with cairns with glacial lake, climbing for short while as the path leads downhill to a large pasture land at Dig Kharka, walking for an hour across boulder strewn hillside to reach Khare for set overnight camp. 10Trek to Mera Base Camp 5, 300m/17,384 ft - 04 hrs.Today, journey leads to our main destination to Mera peak, as the walk leads over Mera Glacier, heading straight on ice sections for short while, then gentle descent reaching at Mera Base Camp for the overnight camp, with time for relaxation and preparation for Mera peak climb. 12 Trek and climb to High camp 5,780 m / 18,958 ft - 04 hrsAfter a day at Mera base camp, walk further up to set High Camp to make approachable to the summit of Mera peak, normally climbers make it from the base camp to Mera peak, but it is always safe and best adding more camp before the summit bid. Morning leaving Mera base camp, trek heads across Mera La to reach Mera High Camp, after few hours of hard walk on high altitude with few stops in between reaching at Mera High Camp, for last camp before the climb, afternoon our expert guide will scout area of the route of climb and fix ropes where necessary, rest of the day preparation for Mera Peak climb this high camp offers outstanding view of Mt. Everest, Mt. Makalu, Mt. Cho Oyu, Mt. Lhotse, Nuptse, Chamlang and Baruntse peaks. 13 Climb Mera Peak summit at 6,461 m / 21, 1907 ft - 08 hrsOur final and Grand Day of the adventure, starting early morning before dawn for the summit, route leads with steep climb; after a hard strenuous climb without less technical difficulty reaching at top summit of Mera peak, feeling on top of the world at this extreme height with view of panorama that surrounds this top with Mt. Everest, Mt. Lhotse, Mt. Makalu, Mt. Cho- Oyu all the way in the eastern horizon Mt. Kanchenjunga including series of other snow capped peaks, after a hard climb, descend with care to base camp. 14 Trek to Tagnag 4,360m - 05 hrs.After a grand moment and experience of a life time adventure, return back to Lukla a pleasant trek leads back at Tagnag for overnight stop. 15Trek to Thuli -Kharka 4,200 m- 06 hrs.From Tangnag morning walk leads back into tree lines of blue Himalayan pines and rhododendrons, passing grazing areas with gentle climb with views of Mera Peak and other high mountains, at Thuli– Kharka for ovenight before the climb over a pass crossing Naulekh ridges before Lukla and Chutanga. 16Trek to Chutanga 3,430 m - 05 hrs.Morning our walk head towards a steep climb at Zatwar-la pass with grand views over Dudh Kosi River and Numbur Himal, after a brief stop on top of the pass a steep descend brings you at Chutange for last overnight stop just before Lukla. 17 Trek to Lukla - 04 hrs.After an exciting and fantastic Mera Peak climbing, our last day walk of this adventure leads on the same trail with short walk back into lovely woodlands and then reaching at Lukla on good time for overnight stop where you can celebrate the victory and success of the climb among fellow staff-guides and members. 18Fly back to Kathmandu afternoon free at leisure.After a fabulous time around world’s highest Khumbu and Everest region with climb of Mera Peak, morning a scenic and exciting flight brings you back at Kathmandu, on reaching Kathmandu after a short 30 mins flights, transfer to your hotels with afternoon free at leisure or last day shopping souvenirs and handicrafts. 19Spare and free day in Kathmandu.We have reserved this as contingency day in case of flight delay or problem with the bad weather during the trek and climb to Mera, if all goes well as per the itinerary enjoy this day relaxing and sorting the climbing and trekking gear with tour options around Kathmandu. 20 International Departure for Homeward bound.As per your international flight time transfer towards Tribhuvan International Airport for the journey back home or to respective destinations after a super and amazing time in Nepal Himalaya on Mera Peak Trek & Climb. We climbed Mera Peak Trek And Climbing With Reasonable Treks And Tour/Anil Dhunganaprovided we Very helpful and professional assistance in planning for Mera Peak Trek And Climbing he’s is Organization for 20 Days Mera Peak Trek And Climbing, Mr. Anil He is Recommendation climbing Guide Nima Sherpa and porters were very friendly and they adapted the trip to our wishes. We take a lot of photo during climbing times We did it. Wonderful and amazing experience to reach the Top at Mera Peak. climbing Guide Njma he gives to everything information details on the way I Show village and mountain. Really enjoyed the climbing in Nepal, Thanks to our Guide Nima Sherpa also porters, we want to highly recommend this company and staff for other travelers. Thank you so much, Mr. Anil, .we really happy for your Trip. We will back Next Time! !